A new report released today shows that strategies developed and mistakes made during Australia’s decade-long Millennium Drought provide a powerful resource for California, as the state enters its fifth year of severe drought. 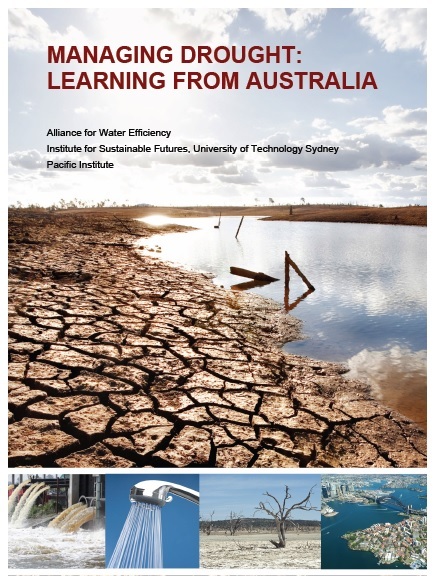 Managing Drought: Learning from Australia, a report by researchers at ISF, the Pacific Institute, and the Alliance for Water Efficiency, provides an overview of key events and initiatives implemented in Australia’s four largest cities: Sydney, Melbourne, Brisbane, and Perth. The report was funded by the Metropolitan Water District of Southern California, the San Francisco Public Utilities Commission, and the Water Research Foundation. Australia survived the Millennium Drought by demonstrating world-leading innovation and water planning and management, said Professor White. An important factor in the success was community involvement which rallied support to lower household water demand to a target of 37 US gallons per person per day. The New South Wales Government had a policy of “readiness to construct” for its proposed Sydney desalination plant on Botany Bay. However, that was overturned and the contract signed when dam levels were already rising. The result was a $US1.4 billion stranded asset and a plant that is still in mothballs. “Having more flexible, modular and adaptable supply options – dams, major pipelines, desalination plants, recycling capacity – can save a lot of money and prevent the construction of stranded assets,” said Professor White. Broad community involvement across sectors – households, business, industry and government – fosters a sense of fairness and collaboration in saving water. Clear, credible communication about the drought situation and response is needed to maximize public participation and support. Innovative water-pricing mechanisms, not employed during Australia’s Millennium Drought, could be used to incentivize water savings in California. On May 2, 2016, Water Program Director Heather Cooley, Mary Ann Dickinson of the Alliance for Water Efficiency, and Dr. Stuart White of the Institute for Sustainable Futures held a free webinar on the report. View a recording of the webinar here. Read more about the California drought here. To download a partial Portuguese translation of the report (through page 37), click here.